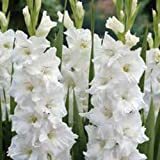 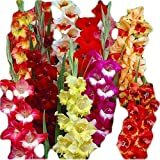 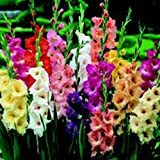 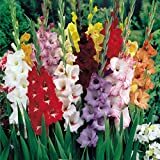 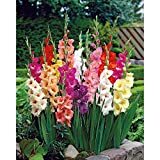 Gladiolus growing geophyte herbaceous of the genus Gladiolus also known as Sword lily or Gladiola, Gladiolus perennial deciduous used as ornamental cut flower plant, can grow in mediterranean, subtropics or temperate climate and growing in hardiness zone 5-10. 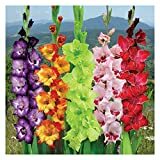 Flower color can be: red, white, yellow, purple, pink or orange can be more than one color in the flowers, the flowers grow on stalk and start to bloom from bottom to the top. 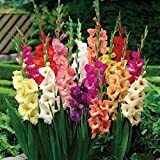 Flowers color can be: red, white, yellow, purple, pink or orange can be more than one color in the flowers, the flowers grow on stalk and start to bloom from bottom to the top.